Chairman of the US Senate Committee on Armed Services Senator John McCain. Arizona Senator John McCain, one of the leading foreign policy voices in US Congress, urged the expulsion of Turkey’s Washington ambassador Serdar Kılıç after violence erupted between protesters and security guards of Turkey’s autocratic President Recep Tayyip Erdoğan, during his visit on Tuesday to Washington DC. “We should throw their ambassador the hell out of the United States of America… This kind of thing cannot go unresponded to diplomatically,” Senator McCain, the head of the Senate Armed Services Committee, told MSNBC in an interview on Thursday, adding that legal action could also be pursued. 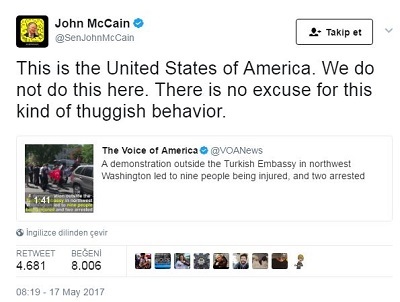 Republican Senator McCain has also said on Wednesday that there “is no excuse for this kind of thuggish behavior” after eleven people were injured during a protest on Tuesday outside the Turkish embassy in Washington. It has also been learned that the US State Department has summoned Turkish Ambassador Serdar Kılıç on Wednesday over the street brawl in Washington. The United States voiced its “strongest possible” concern to Turkey over the street brawl that left at least 11 people injured and appeared to include members of Erdoğan’s security detail kicking people who were on the ground. The State Department condemned the attack as an assault on free speech, issuing a statement to express its concern regarding the violence outside the Turkish ambassador’s residence. Eleven people were injured, including a police officer, and nine were taken to a hospital, Metropolitan Police Chief Peter Newsham said at a news conference on May 17. Also a group of Republican lawmakers called the incident an “affront to the United States” and called for Turkey to apologize. President Erdoğan met with US President Donald Trump in a scheduled gathering on Tuesday. During his visit to the Turkish Embassy in Washington, D.C., after the meeting, Erdoğan’s supporters and security guards clashed with another group who had gathered outside the embassy building to protest Erdoğan’s policies in Turkey. The protesters held banners that read “Freedom to Demirtaş!” in reference to Selahattin Demirtaş, the co-chairperson of the pro-Kurdish Peoples’ Democratic Party (HDP), who has been under arrest on terrorism charges since Nov. 4, 2016. “Groups affiliated with the PKK, which the US and Turkey have designated as a terrorist organization, gathered yesterday [on Wednesday] without permit in Sheridan Circle in the immediate vicinity of the ambassador’s residence, while the President of Turkey was visiting the residence. The demonstrators began aggressively provoking Turkish-American citizens who had peacefully assembled to greet the President. The Turkish-Americans responded in self-defense and one of them was seriously injured. The violence and injuries were the result of this unpermitted, provocative demonstration. We hope that, in the future, appropriate measures will be taken to ensure that similar provocative actions causing harm and violence do not occur,” the Turkish Embassy said in its statement. Reza Zarrab’s lawyer Şebnem Erişmek. On the other hand, Şebnem Erişmek, one of the lawyers of Turkish-Iranian businessman Reza Zarrab, was seen in front of the residence of the Turkish ambassador in Washington on Wednesday while President Erdoğan was paying a visit to the residence, according to Turkish media reports. Erişmek reportedly avoided revealing to journalists that she is Zarrab’s lawyer. It was not clear whether the lawyer entered the ambassador’s residence and talked to any official. Zarrab was the prime suspect in a major corruption investigation that became public in December 2013 in which then-Prime Minister Erdoğan’s inner circle was implicated. Zarrab was arrested by US authorities in Miami in March 2016 on charges of helping Iran process millions of dollars of transactions when it was under US sanctions for its nuclear program. In a statement in April, Erdoğan said Zarrab’s case would be one of the issues he would discuss with US President Donald Trump when they met in May. “Zarrab is not the son of my father, but he is a citizen of mine. If he has committed a crime, his dossier should be forwarded to the Justice Ministry. If he is arrested on trumped-up charges, we will fall into the category of a country that does not stand behind its citizens, “Erdoğan had said back then. What disturbed Erdoğan and other Turkish officials is that former US Attorney for the Southern District of New York Preet Bharara’s office cited the 2013 corruption investigation into Erdoğan and other Cabinet members in the Zarrab indictment in New York. When the graft probe was launched, Erdoğan’s government retaliated by purging the police chiefs and prosecutors who initiated the corruption investigation and introduced new legislation that restructured the judicial system to establish more political control over it.